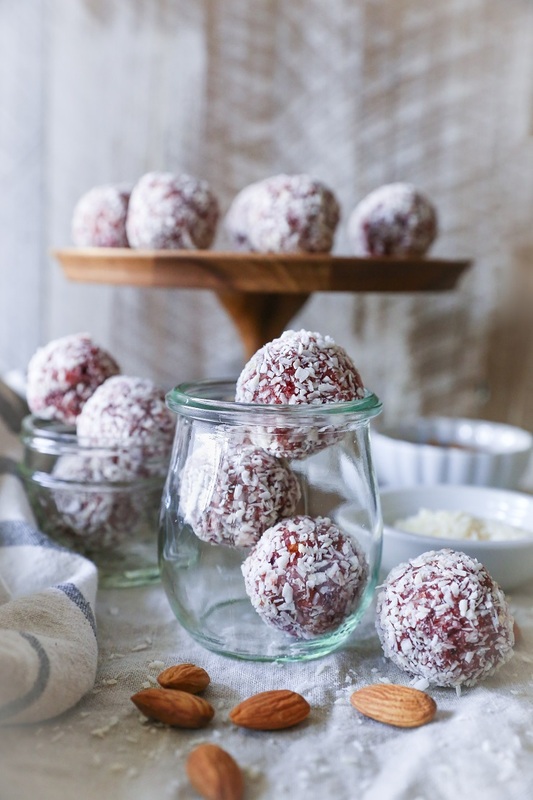 Superfood protein balls with a cranberry bliss twist, and an ultra healthful secret ingredient! …A festive holiday dessert or snack to share with friends and family. Oh hey! This is the first time in years I’ve posted a recipe at night, and I find it completely refreshing and utterly rebellious. Like taking a shower after not showering for four days (not that I do this ever…read: I do this always), like going commando even when it’s not laundry day, like putting heavy whipping cream and whisky in your morning coffee because HALLO it’s the holidays, like calling in sick because you feel too well to be at work, like indulging in your Instagram feed for more minutes slash hours than you’d dare admit, like…you get the point. The title of this post has made me think long deep thoughts about happiness v. bliss. Do we dare discuss? Are we solid enough in our relationship that we can gaze into each others pupils, go there, and when all’s said and done, still make eye contact? We spend our lives trying to find happiness, but bliss? Bliss finds us…typically in the most unsuspecting of ways. It finds me on a snowy morning while I’m sipping on coffee in my favorite sweatshirt and moccasin slippers. It surrounds me at the top of a mountain. It shows up during meaningless lighthearted conversation with a stranger. It presents itself in the perfect sweet or savory bite that melts perfectly on my tongue, driving pleasure sensors to my brain in a way few stimuli can. It’s the ludicrous elation I feel during those vital 10 seconds of rest after the 40th 30-second Tabata, or even better: that momentary connection with another human that feels like an actual eternity. For me, those rare nuggets of bliss that occur at complete random are what make life utterly mysterious, completely beautiful, deliciously complex. And since we’re discussing the intricacies of bliss, we may as well dive into the intricacies of these balls. As in, hard stop on the bliss convo, soft enter on the ball discush. 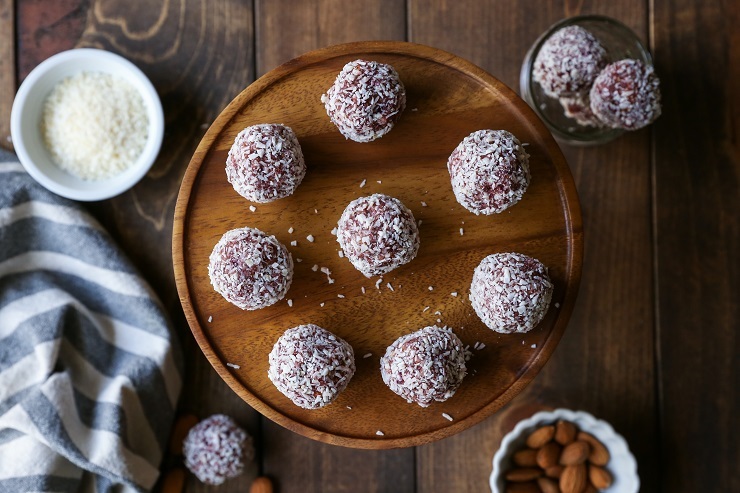 Only a few ingredients are required… Using almond flour, roasted beets (yes, there is a VEGETABLE in these balls! ), dates, shredded coconut, and dried cranberries, these simple whole food-based treats are both pleasurable to prepare, pleasurable to share, and to consume.When whizzed up in a food processor, this cranberry bliss magic is made. The only difficult part about this recipe is letting the cranberry bliss ball mixture set up in the refrigerator prior to forming the balls. I caution: you will be tempted. Truth: I won’t tell you not to sneak bites before the refrigeration process is over. 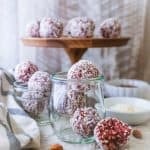 While I haven’t posted many recipes for protein balls (or bites, if you will), I see a great deal of merit in these small capsules of healthy bliss. See, for instance, my Rum Cardamom Fig Chocolate Truffles, Almond Joy Truffles, and No-Bake Nutty Carrot Cake Bites. Packed with nutrients, sweet and nutty, creamy yet tangy in flavor, warm, rich, inviting…balls. 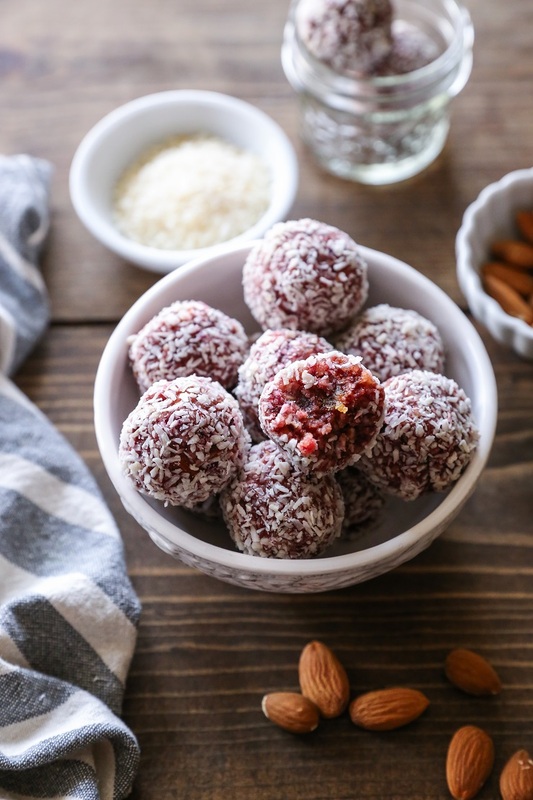 These simple bites were inspired by a very similar recipe I created for Love Beets – the beet coconut energy bites on their site. Where does bliss find you? Add the remaining ingredients for the energy balls to the food processor, and turn it on. Process until a thick paste forms (note: you will need to stop the food processor several times to scrape the sides with a rubber spatula). Transfer this mixture to a sealable container and refrigerate 15 minutes to allow mixture to chill and set up. Form 12 to 14 balls out of the cranberry bliss mixture, then roll in shredded coconut or chopped nuts. Store energy balls in a sealed container in your refrigerator for up to 5 days. * I recommend using dried cranberries that are sweetened only with juice and/or organic dried cranberries for best results. I agree! The blissful moments are always so unexpected and we usually don’t realize it until they’re over and we think back! Ah! I’ve been in love with cranberry everything since last year…so good and always love the color <3 Merry Christmas Julia! Perfect for cookie making day! They are healthy and don’t require an oven. They are so pretty too. The kids will be able to roll these into balls. And, if they eat a few…no problem!